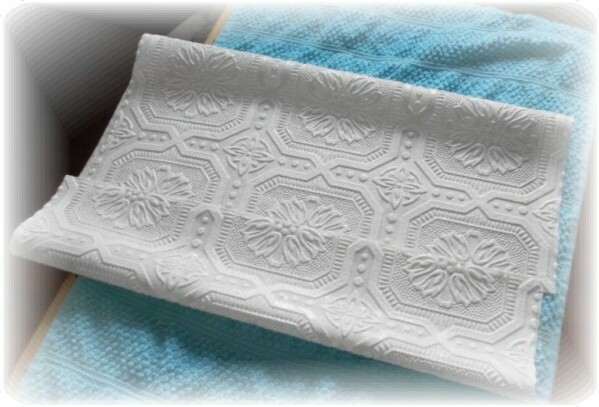 Today I would love to show you how I created the faux celing tile panelled wainscot in my dining room. I really enjoyed this project. It was fairly simple and fun to do. 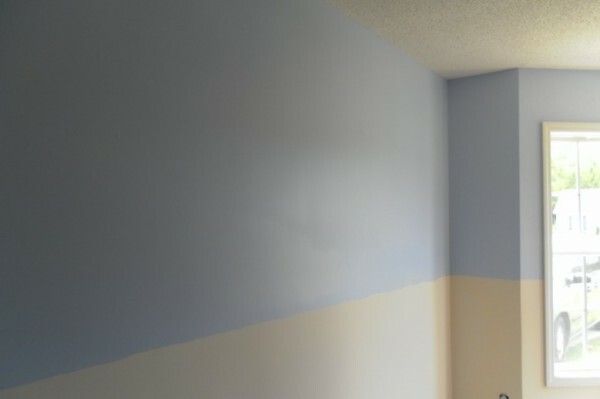 I started by painting the top half of the walls this beautiful blue by Olympic called Determination. I painted the bottom half a basic white in an enamel finish. 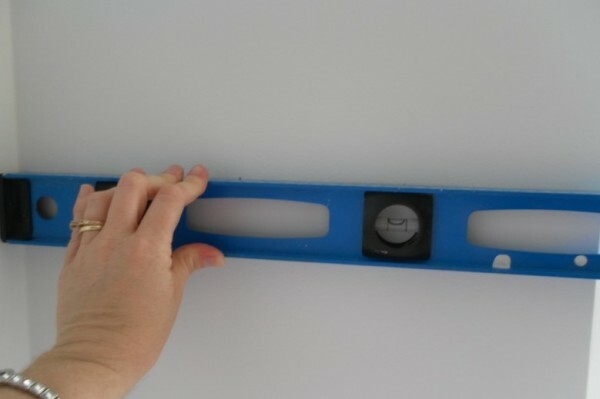 I used a level and measuring tape to mark my walls all the way out of the room to ensure a straight line at chair rail height. Once I figured out the size and height of each panel I went around with my level and drew a very light pencil line on the wall. This would ensure all the panels were hung straight and at the same level. 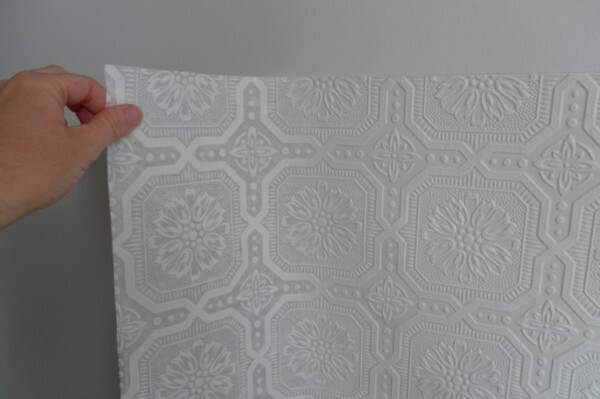 I bought this roll of textured, paintable wallpaper that mimics vintage ceiling tiles at Lowe’s Home Improvement for around $16.00. I only used one roll for this project and I have plenty left over. Hmmm, I wonder what ELSE I will be slapping this stuff on! So, anyway I came up with a layout for the panels and began cutting accordingly. I kept all the pieces the same height but the width varied from wall to wall, depending on the size of the wall. 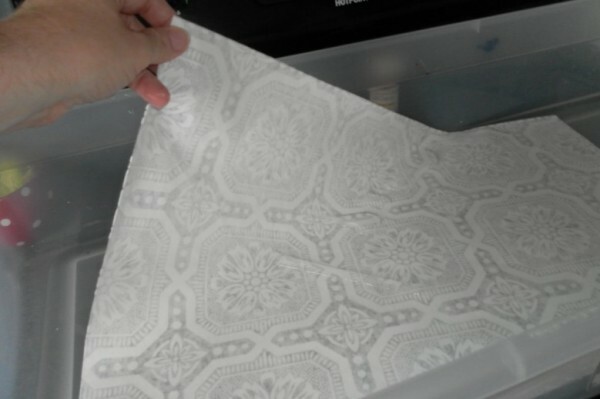 Working with one piece at a time, I placed the wallpaper in warm water to activate the adhesive. Although the instructions did not call for “booking” I felt it was a good idea to do it for a minute or two. Booking is the procedure of temporarily folding, not creasing, pasted surfaces on to each other for easier handling and allowing time for the adhesive to soak into the paper, keeping it tacky until ready to hang. 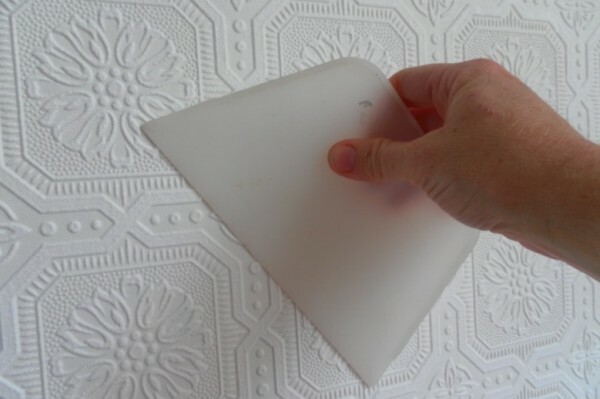 It allows the wallcovering to relax, which helps to prevent stretching and shrinking that can cause seams to show. Also known as Accordion folding. 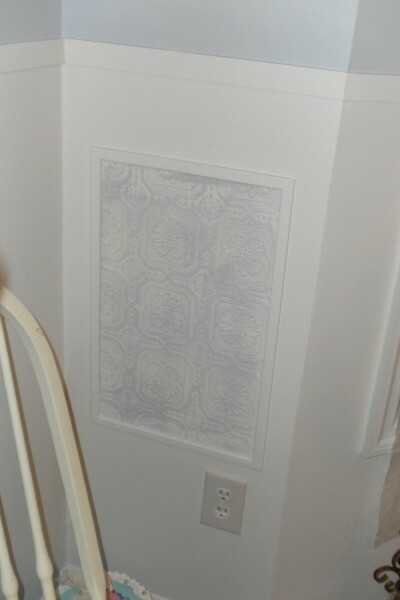 I then applied the wallpaper to the wall, lining it up with the pencil line to make sure it was straight. Working from the inside out, I smoothed the paper to the wall making sure I removed all air bubbles and creases. 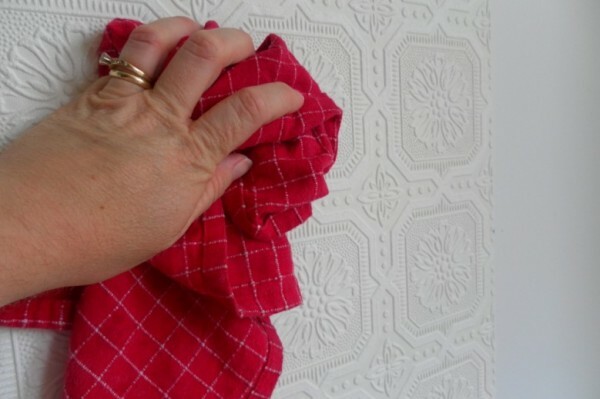 I then wiped any excess water and drips with a dry clean cloth. I originally thought of doing only two panels on either side of the china cabinet but had so much fun hanging the first two panels I continued around the entire room. I was able to avoid messing with any electical outlets and because I was only hanging small panels I didn’t have to worry about seams. Now for the fun part. My husband bought me this miter saw a couple of years ago. I don’t use it very often but when I do I love it! I wanted to add a simple chair rail and frame each panel in thin moulding to give it a finished look. 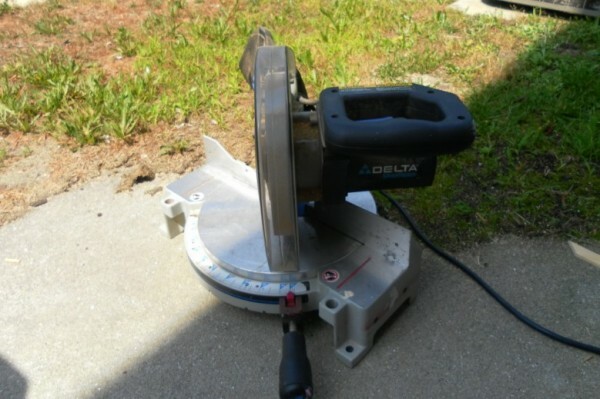 I dragged this baby out of the garage so I could cut each piece at 45 degree angles. To cap off the chair rail I used a very thin strip of wood used for lattice that was about 1/4″ thick by 2″ wide. 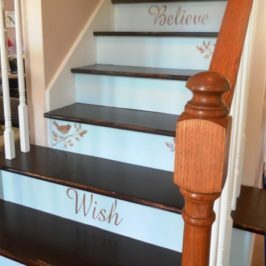 I am not a master carpenter and I thought this would be easy to work with considering I had to work around some funny angles in the bay window area. It was also very inexpensive at less than $8 for a 12 foot piece. I think I used 3-4 pieces for the whole room. 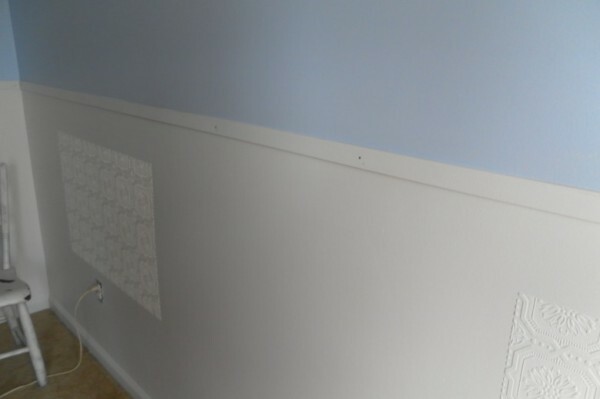 I prepainted each strip white before attaching it to the wall with liquid nails and finishing nails. 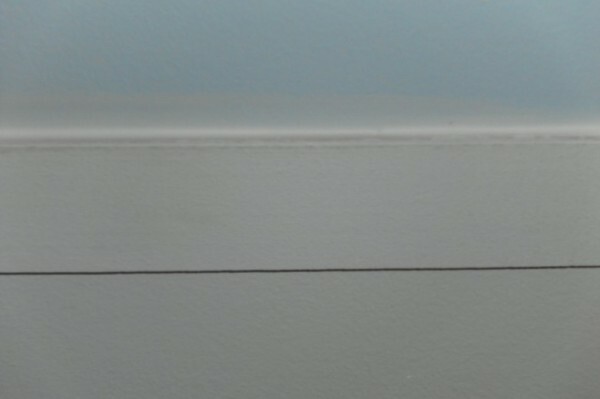 I finished it off with a thin bead of caulk on the top to cover any gaps or seam lines. A little touching up with paint and I had a simple chair rail. And now for trimming the panels. 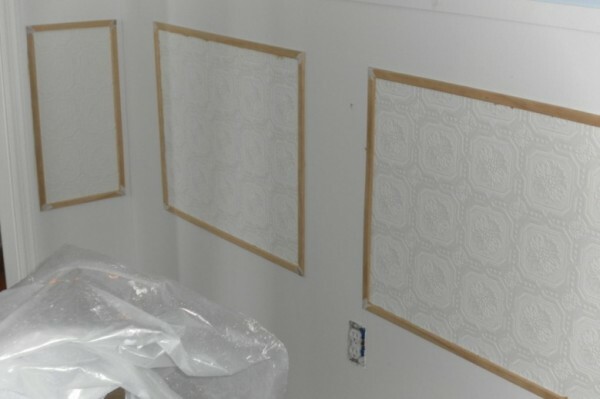 I picked a thin 1 inch moulding with rounded edges to frame each panel. 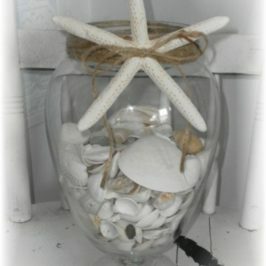 Again, simple design, easy to work with and inexpensive. I measured each panel and cut the trim with my miter saw accordingly. I attached each strip with a small bead of liquid nails and finishing nails. To cover up any imperfections and to hide any gaps I added spackle to each corner. 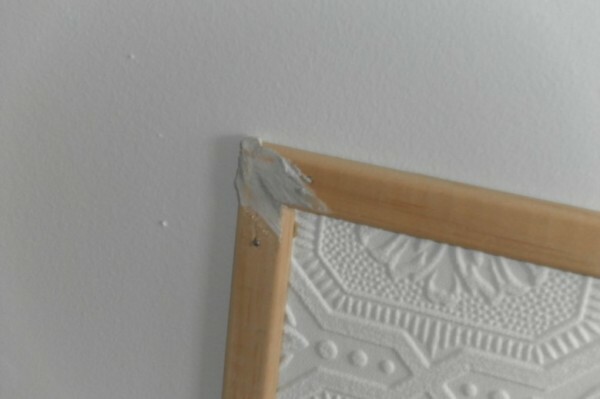 **Note** Spackle is a great way to hide imperfections in many projects. 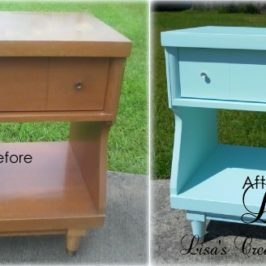 ** Once its sanded and painted, no one is the wiser! 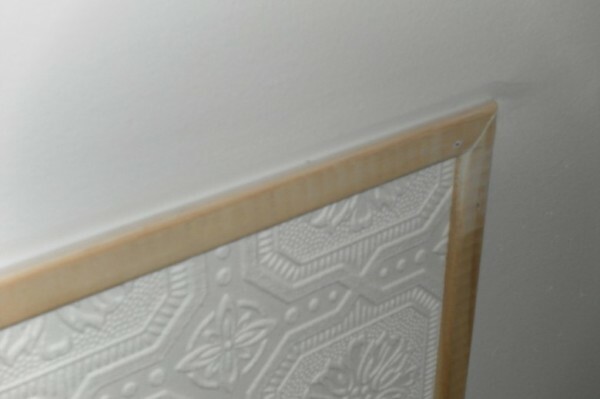 I also added a bead of caulking to the tops of each panel to hide any gaps in between the trim and the wall. After sanding the spackle I was ready to paint! I gave each panel and coat of white paint. Remember the pretty color blue from the top half of the room? 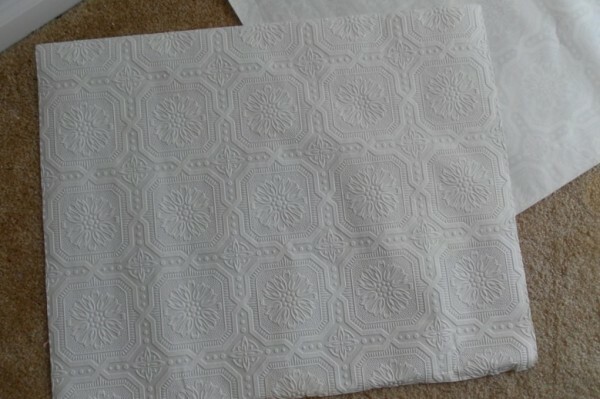 Well I used some left over paint and did a dry brush technique over the wallpaper to accentuate the texture of the paper and bring out the pattern. And…voila! 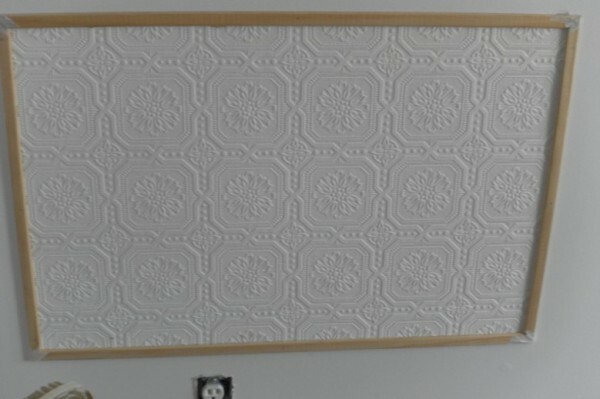 A faux ceiling tile inspired wainscot treatment! I am very happy with the turnout and overall look of this project. 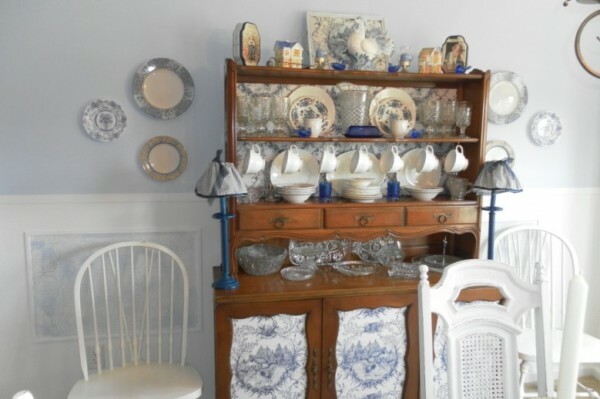 It adds interest, texture and character to the dining room and was done easily and affordably! Here is a photo of the room all done. 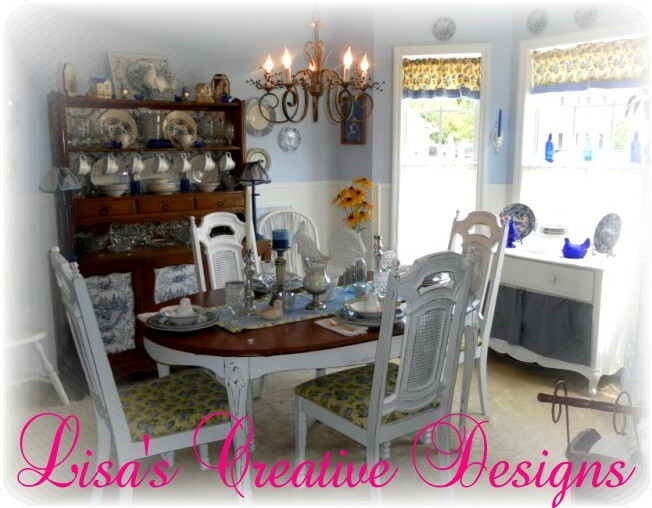 If you missed my original post on this entire dining room redesign (Done on less than $200!) you can see that post HERE . Thanks a bunch for stopping by today. 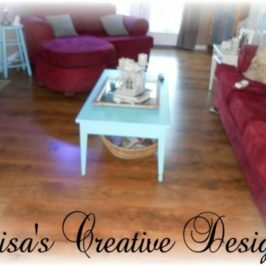 I hope you enjoyed this post and have become inspired to tackle your own projects! Stay tuned for glimpses of future design projects! 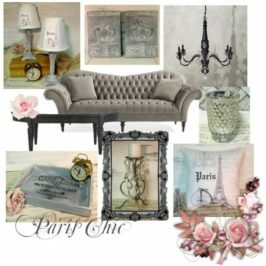 Love your cheery room!! 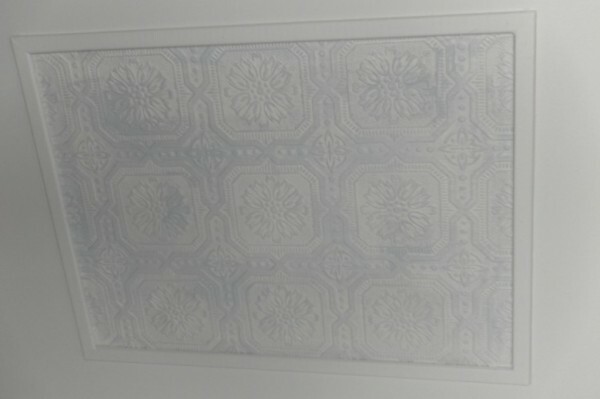 I used this same wallpaper for 2 ceilings and it was a challenge as I had never wallpapered ceilings before. Love the look though! Great idea using it this way too. 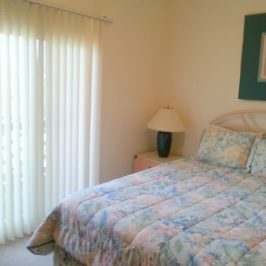 Your room looks beautiful great job!